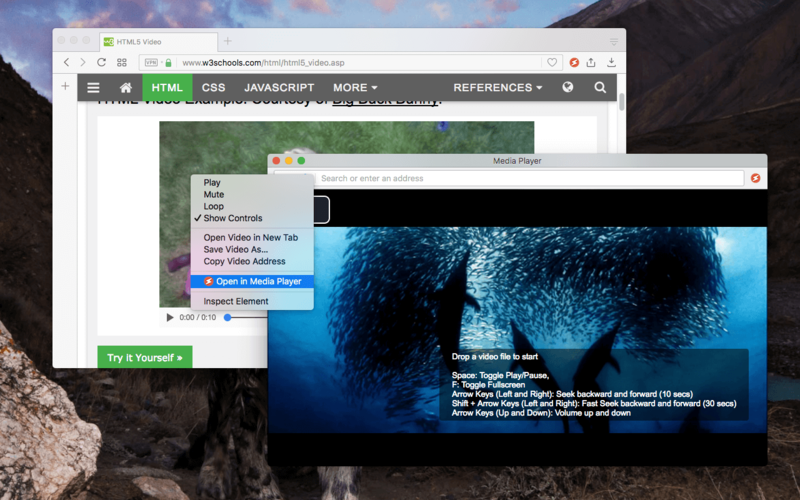 "Media Player" is a cross-browser extension to play video and audio files without the need to an external media player. It uses the internal HTML5 video element to decode media files and play them. The extension is written on top the well-known video.js library with a set of custom plugins to enhance the accessibility of the player and to take advantage of browser APIs like remembering the playing history or using browser-level or global-level keyboard shortcuts. What can I expect from the "Media Player" extension? "Media Player" extension aims to use the built-in media player of your browser to allow you handle your media needs without the need to use any external application. Well, as far as your browser recognizes the media source (can decode this media format). For instance, at the moment there is no support for "AVI" format. "Media Player" extension supports a set of keyboard shortcuts in the player interface to toggle playing status, or increasing volume (see the next FAQ for the complete list of shortcuts). Also, it supports three browser or global-level shortcuts to toggle playing status, move to the previous or the next tracks. To enable the global shortcuts open "chrome://extensions/configureCommands" in a browser tab (note that each browser has a custom setting page to configure keyboard shortcuts). What are the supported keyboard shortcuts? How can I add new tracks to the player? After starting the player by pressing the toolbar button, use the big Play button to browse for media files or just drop media files into the player interface. To add more tracks later, just drop more media files into the player interface. Can "Media Player" extension display video subtitles (captions)? Yes, this extension currently supports two types of subtitle formats (SRT and VTT). It is recommended to use the "VTT" format as it is the only compatible format that browser understands. If you drop an "SRT" format subtitle, "Media Player" converts it into the "VTT" format and then pass the subtitle to the VIDEO element. Can I increase or decrease the font-size for subtitles? Yes, when a video has a subtitle, you will get a new button in the control list. Hit the button and then select the settings link. You can change font-family and font-size of the subtitles. Note the currently your changes are not persistent. You will need to apply them after a restart. How can I ask "Media Player" to load subtitles for this track? Although the subtitle file is located in the same folder, still the extension is not displaying captions. First, make sure the subtitle file has the same name as the original file just with a different file extension. Then make sure it has either "VTT" or "SRT" format. If not, use an online service to convert your subtitle file. Then close the "Media Player" extension and drop both media and subtitle files together into the player area. Note that since "Media Player" is a browser extension, it has no access to the local disk, and hence you NEED to drop both files for the extension to parse captions. How can I set a global keyboard shortcut to toggle the playing status? Can I use this extension to watch YouTube videos? No at this moment there is no support for YouTube. However, if you have a direct link to a media file, you can drop that link to the player interface. "Media Player" will try to fetch and play the media file exactly like it is a local file. If you have questions about the extension, or ideas on how to improve it, please post them on the support site. Don't forget to search through the bug reports first as most likely your question/bug report has already been reported or there is a workaround posted for it.